We’re used to Palmako’s range of log cabins being both attractive and functional, and that’s certainly what they delivered here. Its smart hexagonal design not only looks great, it also means that it can fit easily into a corner. 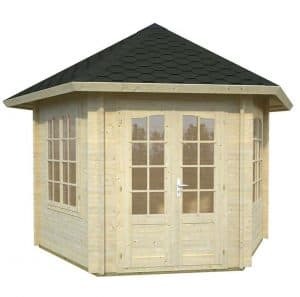 This means that even gardens with a limited amount of space can now benefit from the advantages that a well sized log cabin such as this can bring. The apex roof at the summit is particularly decorative, thanks to its covering of bitumen shingles, but it’s also very effective at channeling rainwater away. This means that you can be confident that the contents will remain dry, especially as the thick interlocking logs are also very water resistant. As well as keeping rain and snow out, the high quality logs also create a structure that feels very strong and stable, even in windy conditions. You might also like to see the top 10 10×10 shed currently on sale in the UK by visiting the WhatShed 10×10 shed awards league table. The dry and welcoming interior can also be cooled and ventilated easily when required, as the two large windows that bring light flooding into the interior can also be opened. There is also glazing on the double doors, but what we liked most about them is that they come with an integrated key operated locking system for added security and peace of mind. We review lots of log cabins, and yet this is one of the few that we’ve seen in a hexagonal design. 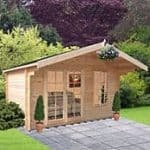 That gives it added functionality, as it makes it very easy to fit into even tight corners of a garden, meaning that even properties where space is at a premium can have the log cabin they’ve always dreamed of. We have to say that this is also one of the most attractive log cabins that we’ve seen, as from the roof to the glazing everything seems to have been created with aesthetic appeal in mind. The roof is just one example of this. On top of a solid tongue and groove base sit bitumen shingles. The effect is highly decorative yet it’s also very effective at carrying rain and snow away from the interior. We were also struck by just how tall the roof is at its peak, giving a ridge height of 3.36m, or 11 feet, and an eaves height of 2.27m. When finding a suitable place in which to situate the cabin, you’ll also need to know the overall width and depth which are both 3.03m, although these dimensions increase to 4.44m when the overhang is taken into account. 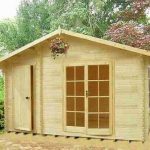 One advantage that a log cabin typically holds over a large shed is that the cladding is thicker and therefore stronger. We certainly found that here, with a log and frame thickness of 34mm. This is thicker than we find on many of the cabins we review, and means that the building feels reassuringly stable when the installation is complete. Because the logs lock tightly together as well, there are no gaps for rain to penetrate. We were pleased to see that the floor was made of tongue and groove cladding, as with a thickness of 19mm as used here it’s very strong. It means that it should have no problem taking heavy items of furniture. 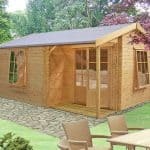 There was so much that we liked about this log cabin that it makes it even more disappointing that it failed to deliver on its pre-treatment and warranty. 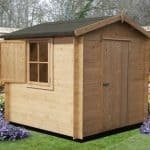 We feel that all wooden garden buildings should come with some form of pre-treatment applied to keep the threat of rot at bay, and at this price we expect to see a long lasting solution such as a pressure treatment. Unfortunately no treatment has been used prior to shipping, which means that the customer will need to add coats of a high quality wood preserver immediately they install it, as well as topping this up every twelve months. This can be time consuming and costly as well, and it’s also worth noting that whilst there is a five year structural guarantee no extended warranty is provided against rot. It was good to see that the double doors on this cabin were slightly larger than on some that we review, as this makes it easy to bring in the furniture and other items that make a log cabin such an enjoyable space to spend time. The door width is 1.14m and this is also complemented by a door height of 1.80m which is again slightly more generous than average. The doors are glazed across their middle and upper section, and further natural light is provided by two large windows. When inside it’s noticeable just how much light they allow in, and because they’re double glazed they also effectively keep our exterior noise and keep in heat. These insulating properties will be especially appreciated outside of the summer months. Double glazing has another useful function, and that is that it’s much tougher to break than standard glass. This can act as an important deterrent against intruders, but the best deterrent of them all is a good quality lock. We were very pleased, therefore, to see that the double doors feature a key operated lock. If you plan on storing anything of particular value inside then it can be worth adding an alarm as well, but this needn’t be an expensive purchase. We found this cabin quite easy to put together as it comes with clear instructions and all the fixtures and fittings needed. We appreciate, however, that some people will find the prospect of assembling such a large and complex building quite daunting, which is why it’s good that a professional installation service is available. Be warned however, that at a price of £654 this will significantly add to your initial outlay. As shown by the use of superior thick cladding, there is real attention to quality throughout. Whilst the building is structurally sound, and comes with a 5 year structural guarantee, we feel it should have had a pre-treatment to protect it from the threat of rot. 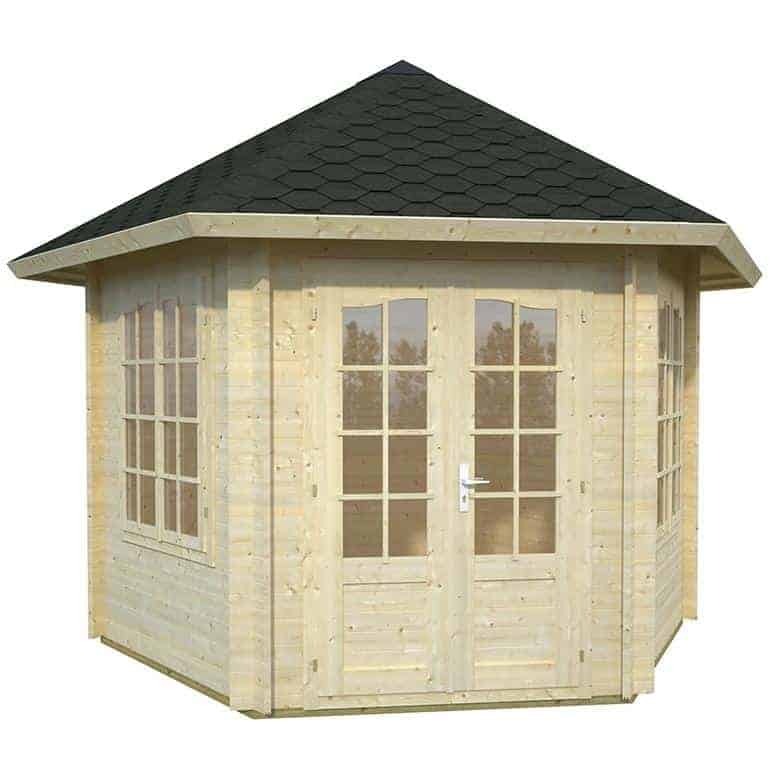 Whilst we’ve reviewed log cabins that have a much larger base area, this is among the very tallest that we’ve seen. With a modular style make up this is easier to put together than you might think, so with a friend’s help installation can be completed in around six to seven hours. This is a very attractive garden building, and spacious too, but the high price point may put it beyond the reach of some budgets. 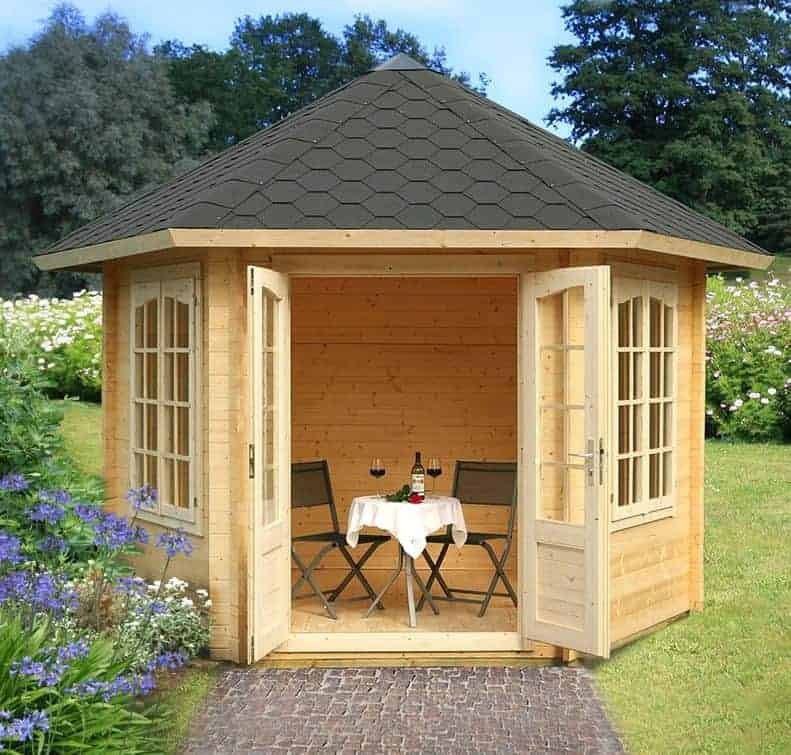 Final Thoughts: Even if you only have a relatively small corner area of your garden to spare, you can still have a roomy log cabin thanks to this hexagonal design from Palmako. As always with their log cabins, we found it very attractive to look at and real attention has been paid to quality or detail. 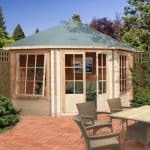 We would have liked to have seen the logs go through a tanalisation process, with the resultant extended warranty period we would expect that to bring, but as long as you’re happy with carrying out an initial treatment and then yearly treatments this deserves to be on any log cabin shortlist.